Brazzaville, the capital and largest city of the Republic of the Congo, was founded on September 10, 1880. The city was on the site of Nkuna, a Bateke village and was named after its part-African founder, explorer Pierre Savorgnan de Brazza. Makoko of the Téké, the local political leader, negotiated a treaty with de Brazza in which he granted the French control over his nation in exchange for protection from neighboring rivals. The city was developed on the north bank of the Congo River in order to compete with the Belgian city of Leopoldville (now Kinshasa) which was established on the opposite bank. From October 1880 to May 1882, Brazzaville was guarded from the Belgians by the troops of Melamine Camara, a Senegalese Sergeant in the French colonial army. In 1884, the Berlin Conference made the area an official French territory. 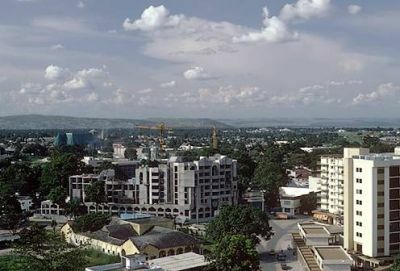 Brazzaville, in turn, was declared the capital of a number of French colonial possessions including the French Congo, French Equatorial Africa, Gabon, Ubangi-Shari (now the Central African Republic), and Chad. In 1924, Brazzaville became linked with Pointe-Noire Port on the Atlantic Ocean through the Congo Ocean Railway. When Nazi Germany overran and occupied northern France early in World War II, while establishing the puppet state of Vichy France in the south of the country, French colonial forces in the African colonies remained loyal to the Free French government in exile under General Charles De Gaulle. Because of the colonies’s support of the Free French government, De Gaulle met in Brazzaville in 1944 with leaders of the African colonies. The meeting resulted in the Brazzaville Declaration where France promised reforms in the colonies including granting their residents the status of French citizens. Prior to 1960 Brazzaville was divided into African and European sections. The Europeans controlled the city center while the Africans had three areas: Poto-Poto, Bacongo, and Makélékélé. By 1980, twenty years after the French Congo became the independent nation of Congo-Brazzaville, the city was divided into seven sections, Makélékélé, Bacongo, Poto-poto, Moungali, Ouenzé, Talangaï, and Mfilou. Since 1990 Brazzaville has felt the ravages of war. The city has seen conflicts between government forces and various rebel groups. During the civil wars in the 1990s thousands of civilians were killed and over 100,000 refugees left the city. It has also been impacted by multi-decade civil wars in neighboring Zaire (now the Democratic Republic of Congo) and Angola. Presently, Brazzaville has a population of about 1,100,000 (with another 400,000 in the surrounding suburbs). Industries include machine shops, textiles, tanning, and manufacturing. The city’s port along the Congo River exports rubber, wood, and agricultural products to the rest of the world.